Year?round comfort is assured with the WR?V Glove thanks to a GORE?TEX® membrane and Primaloft® insulation which keeps out the rain and the cold weather as well as class-leading safety features such as Alpinestars patented finger bridge and EVA foam reinforcements throughout. CONSTRUCTION: Durable 450 dernier poly-textile upper with leather palm for optimized levels of abrasion resistance and comfort. GORE?TEX® membrane lining is breathable and waterproof, keeping the hands dry and comfortable in all conditions. Incorporated Primaloft® thermal insulation, 60g on the top hand for protection against the elements. Thumb and palm reinforcement gives extra grip on the controls while offering great seam reinforcement and durability. EVA padding reinforcements on knuckle, outer hand and palm provides strategic abrasion resistance and improved fit. Alpinestars’ race-derived and patented third and fourth finger bridge prevents finger roll and separation during impact. Touch-screen compatible fingertip for use with smartphones/tablets/GPS systems. 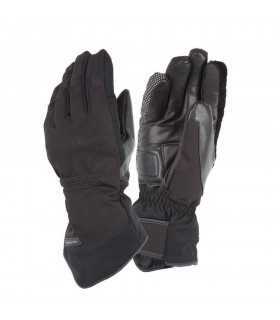 Pre-curved glove construction improves comfort and prevents hand muscle fatigue on longer journeys. Wide Velcro® cuff closure for easy entry and extend coverage. Cuff is designed to close over sleeve jacket to hermetically seal out the elements. Closure includes second wrist fastener to securely and safely keep glove in position. Reflective detailing improves rider’s visibility in poor light. Comes in international sizes: S-3XL.